If you come across paper money printed between 1977-1981 you should be able to find the signature of Azie Taylor-Morton. She was the first and ONLY African American Treasurer of the United States. Azie Taylor-Morton served under the Carter administration. Read More About Azie Taylor-Morton by clicking this link. Whitney Moore Young, Jr. was an effective civil rights leader who served as executive director of the National Urban League for 10 years. This is the 4th stamp issued in the Black Heritage series. This stamp was also designed by Jerry Pickney. On February 15, 1980 Benjamin Banneker, a self-taught astronomer and mathematician and publisher of Farmers Almanacs in the 1790’s was honored on a 15 cent US Postage Stamp. I want to also note that he was one of three people considered for the reverse of the Washington DC 2009 coin. (As you know if you have been reading this blog the placement was given to Duke Ellington. This stamp was designed by stamp artist Jerry Pinkney. The print run was 160,000,000. Read more about Benjamin Banneker by clicking this link. A self-taught mathematician and astronomer, Benjamin Banneker was probably the most accomplished African American of America’s colonial period. In 1753, he constructed the first wooden striking clock made in America. His studies and calculations in astronomy allowed him to successfully predict a solar eclipse in 1789 and to publish farmer’s almanacs in the 1790s. In 1791 he helped design and survey the city of Washington, D.C. This stamp was issued February 15, 1980. There were two Martin Luther King Jr. Stamps released as part of the Black Heritage Stamp Series. The first one is a 15-cent stamp and was issued on January 13, 1979. The second stamp is a 33-cent stamp was issued on September 17, 1999. The artist who designed the stamps is Jerry Pickney. Do You Know Who Was The First African American to Appear on a US Postage Stamp? If you guessed that Booker T. Washington was the first African American to appear on a US Postage Stamp you are absolutely right! Actually Booker T. Washington had a lot of “firsts”. I found out just tonight that he was the first African American to be invited to the White House. 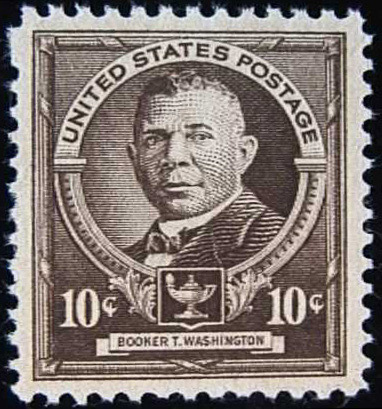 But on April 7, 1940 The US Post Office actually issued a stamp honoring Booker T. Washington as part of a Famous Americans Series. It was, indeed, the very first stamp to honer an African American. The stamp was for 10 cents. You can read more about the Booker T. Washington stamp from 1940 by clicking this link. A 10 cent stamp was a high price during that time. Most people could easily afford to buy the lower price stamp which was three cents at the time. As a result, it received some criticism because it was not affordable by many of the African American community. Posted in African American Coins, African American Stamps, Booker T. Washington	| Tagged african american stamps, Booker T. Washington Stamp	| Comments Off on Do You Know Who Was The First African American to Appear on a US Postage Stamp? The words Harriet Tubman and the Underground Railroad are synonymous. As a conductor for the Underground Railroad she placed herself in danger by helping hundreds of slave escape to freedom. 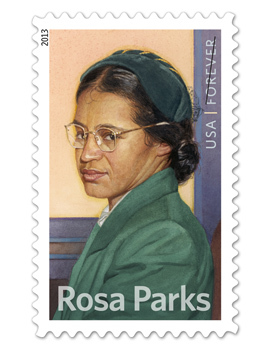 The US Postage stamps commemorating her are a 13 cent stamp issued in February 1, 1978 and a 32 cent stamp issued on June 29, 1995.
Who are the Artists That Painted and Designed the Rosa Parks Stamp? African American Artist Thomas Blackshear II created the original painting for the Rosa Parks stamp. The stamp was designed by art director Derry Noyes. Read more about Thomas Blackshear 11 by clicking this link. Read more about the Art Director for the US Postal Service Derry Noyles by clicking this link. Posted in African American Stamp Artists, Thomas Blackshear 11	| Comments Off on Who are the Artists That Painted and Designed the Rosa Parks Stamp? The most beautiful coin in U.S. history is the design that appeared on the $20 Gold Double Eagle from 1907 to 1933. It is the design of Augustus St. Gaudens. His model was an African-American artist’s model named Hettie Anderson who actually posed for the “Liberty” design. The design on the reverse of the St. Gaudens $20 gold coin. It depicts a majestic eagle in flight, with the sun below and its rays extending upward. Hettie Anderson was from Columbia, South Carolina. Read more about the coin and HettieAnderson by clicking this link. See a picture of the coin currently on sale online. The Rosa Parks Commemorative Stamp was released this month. This stamp is part of the Black Heritage Series which started in 1978. The first stamp released in 1978 in this series was for Harriet Tubman. You can read more about the celebration honoring Rosa Parks by the Postal Service by clicking this link. Each fall the honoree for the next stamp is announced. Usually the stamp is available by the Postal Service for at least a year. That means just like coins you can usually get them directly from the US Mint or the US Postal Service. If your local Post Office does not have the stamp you can order them online from the Mint.So, with that in mind you can order your Rosa Parks Stamps and First Day Covers ( an envelope with the stamp and image) by clicking this link. Legislation was passed to produce a 5 year series of 1 oz. and 1/2 gold medallions that would honor American Artists. Marion Anderson and Louis Armstrong were part of this program which began in 1980. These are not legal tender. No where do they say United States of America. There were 218,624 of the Marion Anderson’s medallion created. And there were 409,098 of the Louis Armstrong 1.0z gold medallions created. Note that these medallions were 90% gold and 10% copper. Many of them were not purchased for collectible value but for bullion value. Hence, many have been melted for the gold content. Today, because of their rarity, they have collector value as well as bullion value. So if you have one that is a good thing. See a picture of the Marion Anderson medal by clicking on this link. You can see a sale of the Louis Armstrong medal and the picture of the coin on both sides by clicking this link. • They were not given a face value to make them legal tender, hence they are medallions and not coins. • Nowhere on the pieces did it say United States of America. • The edges were smooth instead of reeded as was done for almost all gold and silver U.S. coins. • None of them state their gold content. The 1980 issues were shipped in Styrofoam trays, where the gold content was stated on the plastic that covered the Styrofoam. In order to remove the medallions from this packaging, buyers had to discard the information on the gold content. The Mint removed order limits later in 1980. Thereafter, a number of major bullion firms made huge purchases of medallions on days when the price of gold rose substantially. These trading houses informed Bradford that a high percentage of these bulk purchases were melted. In 1986, Bradford estimated that 15 percent of the 1980 issues and 10 percent of the 1981 issues were melted. Today, we think the net meltage is conservatively 20 percent for 1980 and 15 percent for 1981. 218, 624 medallions were made in 1980.